Sciatica without back pain is a serious business. Sciatica without back pain is one of the most challenging conditions seen at the chiropractic coalface. It comes on suddenly and, if weakness develops, it will take a least a month, and probably two, before the strength returns. Making an accurate diagnosis is dependent on xrays and an MRI scan. One of the difficulties is that the nerve impingement may not be at the level where there is extensive degeneration, often misleading the clinician who has no scan. In addition, there are often degenerative discs at several levels, with tender and fixated vertebrae; deciding on which of these is the real spoke in the wheel is no easy task, even with a scan. It takes a careful consideration of all the facts; which reflex is lost, where is the numbness, which muscle is weak, and so forth. In the end there may well be a bit of by guess, and by God, involved; even with the scan it may be a something of a thumbsuck which is the most appropriate chiropractic adjustment to give, and at which level. And that's not just with chiropractic; I recently had a patient with whom I did not succeed. Not having a scan, I was adjusting the wrong level. The surgeon's first attempt failed too, and he had to return a week later and decompress another level before relief of sciatica without back pain. To complicate matters, there is often a degenerative hip, or a fixated sacroiliac joint to muddy the waters yet further. There are numerous possible causes, and I mention three. A prolapsed disc into the foramen. A sequestered disc into the spinal canal. The presence or absence of leg pain, and its location, gives important clues to the location and seriousness of the condition. Notice that sciatica without back pain pertains to Grade V and VI; it's a serious business. Typically we might consider six different degrees of severity. Grade I: Low back pain only; it could be mild or severe. Grade II: LBP plus tingling and or pain in the leg. Grade III: LBP plus actual numbness on testing with a pinprick. Early in this stage the nerve is first more sensitive, and later numb. Grade IV: LBP and leg pain, and loss of reflex and muscle paresis. 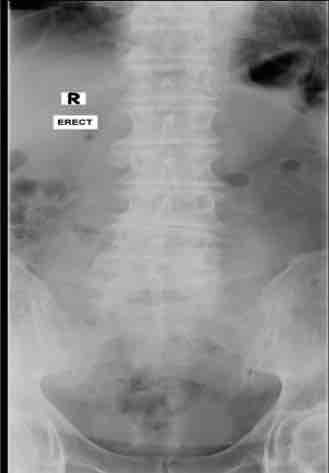 Grade V: No back pain, but severe leg pain. Grade VI: Loss of bowel and or bladder control. The so called cauda equina syndrome; pinching of the horse's tail of nerves. I think it's universally agreed amongst the chiropractic profession that a grade VI needs urgent medical attention. Unless the patient is catheterised he or she may literally burst his bladder. For many years I refused to accept grade V cases, where there were femoral or sciatic signs without back pain. Homan's test and the presence of pulses behind the ankle and top of the foot are mandatory. Only after many years in practice did I realise the power of chiropractic in cases of sciatica without back pain applies too, but each case is clinically challenging. If after three weeks there is no significant improvement, a medical opinion is wise in my book. But don't expect a miraculous cure, because it probably won't happen with chiropractic or surgery. This is particularly true if there is muscle 'paresis'; is your knee buckling for example on the stairs? Can you raise your big toe off the ground? This leg pain muscle testing link will help you get some understanding of whether you have a grade IV or worse lesion. Then our slipped disc rules are absolutely mandatory or you're wasting your time with chiropractic. Sciatica without back pain formerly almost always ended in surgery, but not now necessarily so. In this case we consider a man with severe calf pain, but no back, buttock, or thigh discomfort. In such cases, a DVT or intermittent claudication have to be considered. Is Homan's test positive, and are there pulses behind the ankle and on the top of the foot? Intermittent claudication is caused by a partially blocked artery in the groin, most often. The key sign is pain with walking, but relieved with rest; it didn't fit, and his pulses were normal. It occurs almost exclusively in smokers. The human spirit is an amazing thing; he is 87 years old. Six months previously the roof of their church was severely damaged in a storm, so he and three other men, all over seventy undertook to do part of the repairs. This meant going up a ladder and working above their heads, with their spines in an extended position. Exactly why after three months of such activity, a sciatica without back pain should suddenly strike remains a mystery. He woke up one morning with severe calf pain. Perhaps it was lifting the heavy ladder that provoked the condition. After two days of vacillation, his wife dragged him to the chiropractor. He walked with a marked limp, obviously in severe pain. On examination, there were no signs of a disc herniation, thus we considered that either of the first two conditions above were likely. There was no pain with coughing or sneezing, and forward bending was not particularly difficult; in fact it relieved things slightly. However, extension and left lateral flexion of the lumbar spine immediately provoked severe pain in the posterior thigh and calf. There was loss of the S1 reflex, even with reinforcement, and marked weakness of heel raising, pointing to a S1 nerve root lesion; either a medial disc prolapse of the L5-S1 disc, or a facet entrapment at the same level; this latter would often affect rather the big toe. There were no sensory changes. The knee jerk reflex was also diminished, though present, and there was also some weakness of knee extension; that explains why his knee was giving on the steps. There was no pain in the front of the thigh, so this was not considered the main problem. It may in fact have been there prior to the back injury two days previously. There were, on motion palpation, fixations in the left sacroiliac joint, and at L4 and L5. In retrospect L3 was surprisingly good. Pain with coughing, sneezing or bearing down on the toilet require what is known as valsalva manoever, by the way; signs of slipped disc. This leg pain muscle testing link will give you some idea of how to see if you have so called paresis; weakness of heel raising, for example, as this patient had; if often may affect the big toe too. Slump test for sciatica was positive provoking left posterior thigh pain, but no back pain; odd seeing that his calf was troubling him. Likewise the straight leg raise of Lasegue was positive at 30 degrees, with a negative Braggard's test fortunately. Even so, sciatica without back pain is virtually always difficult. Pre existing L3-L4 disc degeneration and facet syndrome, with no pain, but silent and progressive weakness of the quadriceps muscle. Sudden onset of a L5-S1 facet syndrome affecting the sciatic nerve and causing posterior calf pain. A medial herniation at L5-S1 was still a possibility; it would have caused a similar referral pattern down the leg, but I would have expected lumbar flexion pain, and a positive Dejeurine's triad. About a decade ago, a group of the world's top lower back specialists, orthopedists, neurosurgeons and perhaps one chiropractor, I don't remember the details, met to examine 20 patients with lower back and leg pain. It was a blinded study. Less than 50% of the time were they in agreement about the diagnosis. Such is this case. The neurology suggests a disc prolapse at L5-S1 affecting the S1 nerve root, but the clinical picture points to a facet entrapment, but that should have caused weakness of the great toe, not the heel raise. It would be wonderful to have an MRI of every one of these difficult cases; such should be the case but medical insurance rules mitigate against it. Notice the retrolysthesis of L3 on L4. 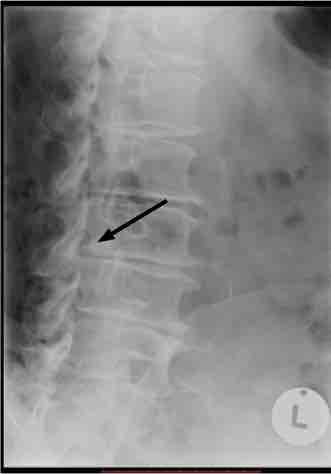 There is marked disc degeneration, and the vertebra has subluxated posteriorly; it's circled. Notice too the extreme facet degeneration at L5-S1 (circled). See the nasty little dagger protruding into the IVF from the body of L3? It's arrowed below. Chiropractic help without total patient compliance in cases of sciatica without back pain is a total waste of time; either follow your DC's instructions to a T or go straight for surgery is my best advice. 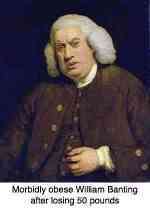 First however consider the complications of surgery. Three days of bed rest, doing prescribed lower back exercises every half an hour, and rising every hour for a short walk around the house. Alternating cold hot therapy, twice a day. Gentle side posture "roll drop" manipulation bilaterally of the L5/S1 joint, and McManus traction. Acupuncture down the course of the S1 nerve root. 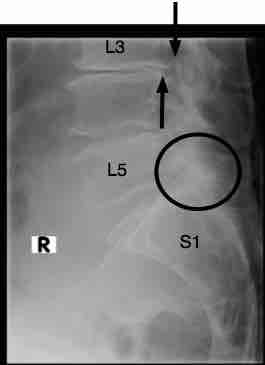 Beginning at the second treatment, Thompson drop protocol for the left sacrum. Both patient and doctor should both remember that sciatica without back pain is almost always going to be difficult, and slipped disc rules should be rigidly followed initially; even if it's a serious degenerative facet syndrome rather than a slipped disc. After treatment 1: No lessening overall of pain, but retracing of the pain out of the calf and into the posterior thigh. After treatment 2: 50% less pain overall. After treatment 3: Knee no longer giving, 75% less pain; still weakness of the calf muscle, no change. After treatment 6: Still 75% less pain, slight in lateral ankle, no back pain, but strength of the calf muscle is returning. That is surprising, it's quicker than expected, probably because he came so soon for treatment. But other signs are improving too. Extension and left lateral flexion cause almost no pain now, the Slump test is very nearly negative. Straight leg of Lasegue is now negative. Happily the chiropractic help has been totally successful. He has no pain, is faithfully doing his lower back exercises, and I've discharged him. It's not always that successful. It's now over a year and he has discomfort in his back periodically, but no actual pain in his spine or leg. He continues to do his exercises faithfully. The rapid improvement confirms that a slipped disc was probably not present; I myself have had a slipped disc into the foramen causing severe leg pain and paresis, and the progress with chiropractic help was slow. Full recovery from my own femoral nerve damage took three months, though the pain abated within two weeks; even now some three years later I get numbness radiating down the inner lower leg periodically. That one can live with; it's pain and actual weakness that are debilitating. And yes I do have occasional adjustments. Maintenance care is important in my book for difficult backs. The structural damage to his spine remains, of course. In fact, it was there before the recent injury. But his days of climbing ladders and extending his spine are over, and perhaps about time at eighty-seven! All the research suggests that prolonged bed rest is a no-no; however when in severe pain, and sitting is forbidden, intermittent bed rest, with exercises is mandatory in my book. Others will disagree. Sciatica without back pain remains a clinical challenge, and sometimes the golden rules don't apply; nevertheless massaging bed rest should most likely be accepted. Go from Sciatica without back pain to lumbar facet syndrome. You can support this site by buying one of my books. This one, Stones in my Clog, is only available as an ebook. Read it on your Kindle or tablet. It considers interesting cases taken from my sojourn in Holland. Gems, funny and healthful, from the life and work of a chiropractor, is how it's subscribed. Only $4. Cheap, but good. Good book to take to bed when you have sciatica without back pain.